Recorded at the Kerrang! Wooargh! Weekender, Caister, 12 October 1984; Pavilion, Hemel Hempstead, 23 October; Royal Court Theatre, Liverpool, 25 October; Glasgow Polytechnic, 27 October; Sheffield University, 29 October; The Gaumont, Southampton, 5 November. 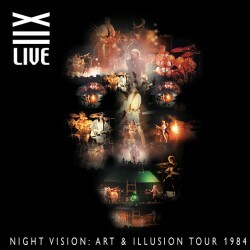 Double CD compilation of recordings from the Art and Illusion tour in October-November 1984, including 4 bonus tracks recorded at the Kerrang! Festival in Caister, October 1984. October 12th 1984 was an important date in the Twelfth Night calendar, as not only was it the day that the Art And Illusion mini album, the first recordings to feature Andy Sears on vocals, hit the streets, but it also saw the group headline the opening night of the Kerrang! Wooargh! Weekender festival. This festival appearance, their first gig since the triumphant Dominion concert back in July, kicked off a 17-date tour that saw the band stepping up to headline major theatres across the UK, and also take their first steps out of the country with a performance in Germany. Although an ambitious move, it reflected the growing popularity of the group who were being actively courted by several major labels. As on previous tours, several shows were recorded from the soundboard, although as their purpose was as a reference for the group to check arrangements and running order, rather than as a collection for eventual release, the tapes are mostly incomplete. However taking the same approach as with the Corner Of The World Tour archive CD, we have been able to recreate a ‘virtual’ concert using the best available version of each song played during the tour. As a bonus, the second CD of this set also includes four tracks from the band’s performance at the Kerrang! Festival at Caister.